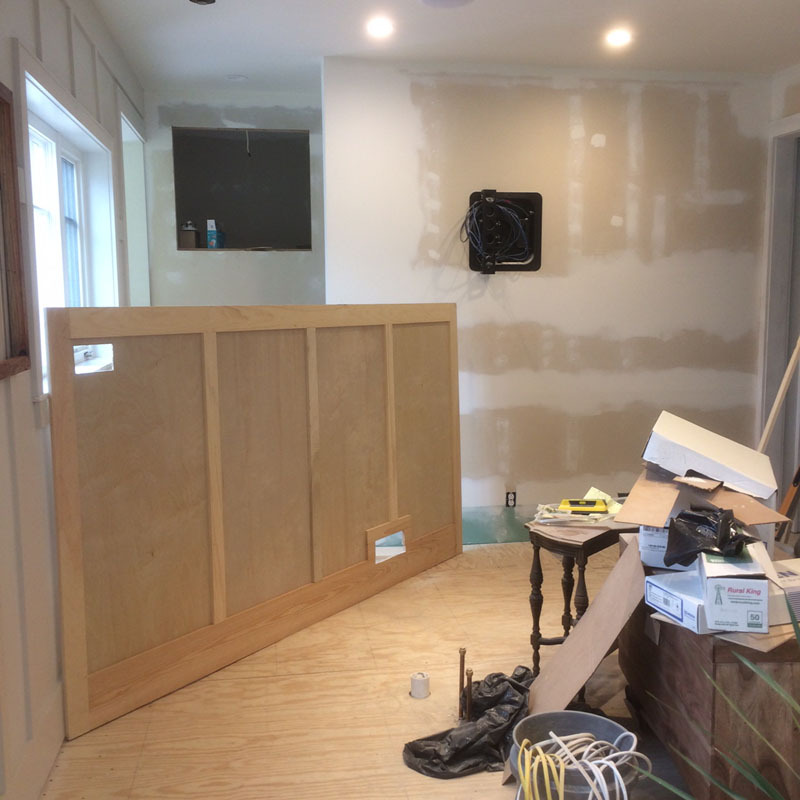 As we continue to work our way towards finishing the walls in the kitchen – it’s time to paint something! I’m using the same paint as the sunroom walls. Sherwin Williams Egret White. The two offices on this floor have color on the walls, but the main living rooms are all done in a very neutral pallet – that’s because I have a lot of art that goes in these spaces and I like the walls that don’t get art to have a tone on tone texture. I’m trying to let shadow lines not color add the detail. I hope this works out. 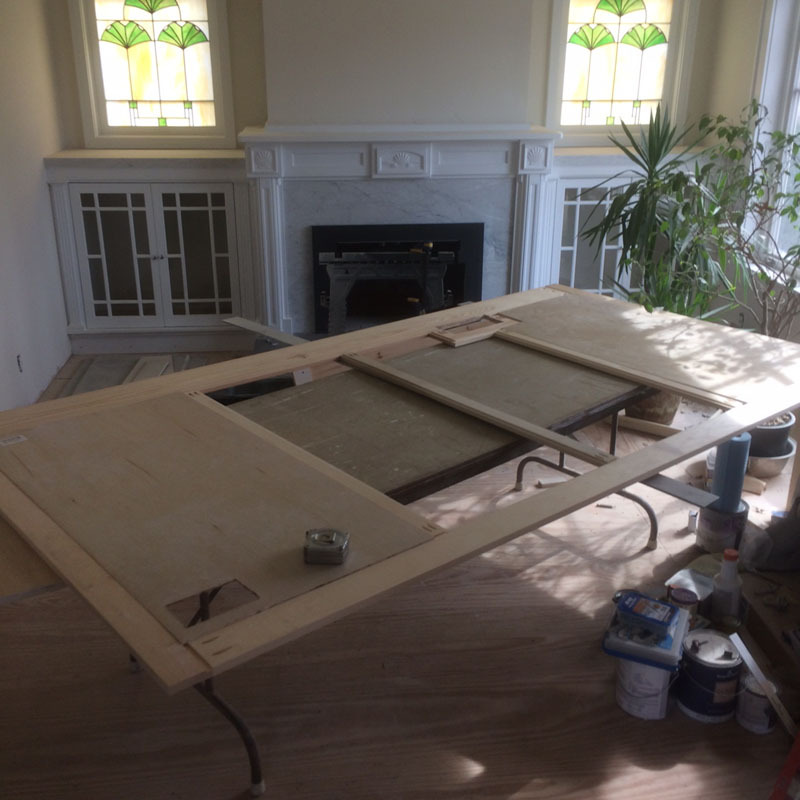 The paneled wall gets two coats of the color paint and then two coats of water based Varathane polyurethane in a satin finish. The water base is used as it doesn’t yellow over time. The clear coat changes the color and texture, giving the walls a very smooth finish. 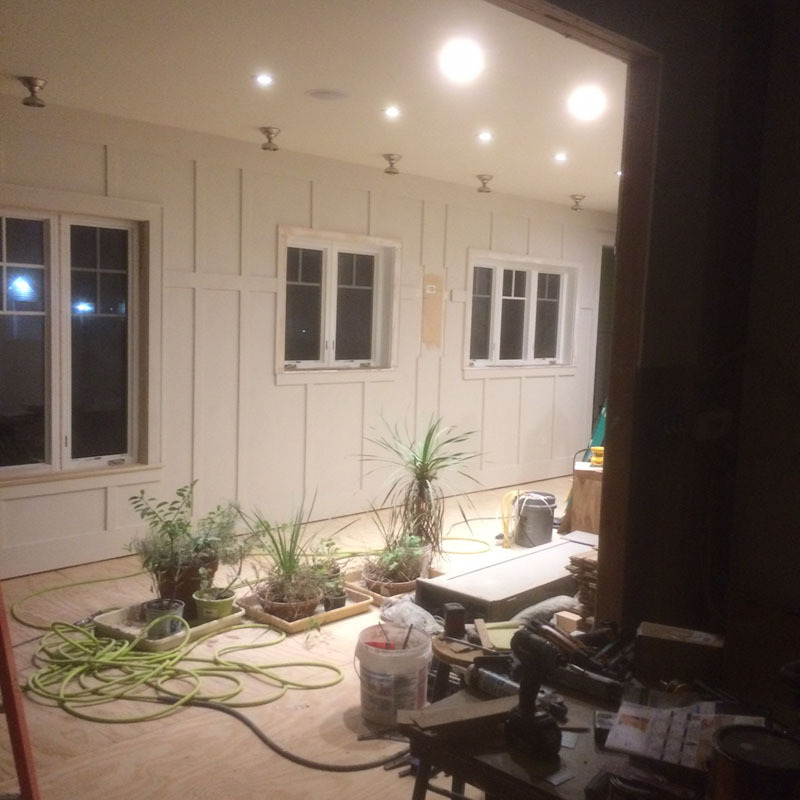 Of course, the plants are still there, but they’ll move outside soon – probably as soon as I finish the room. As I work my way around the kitchen walls I have run into a legacy problem. 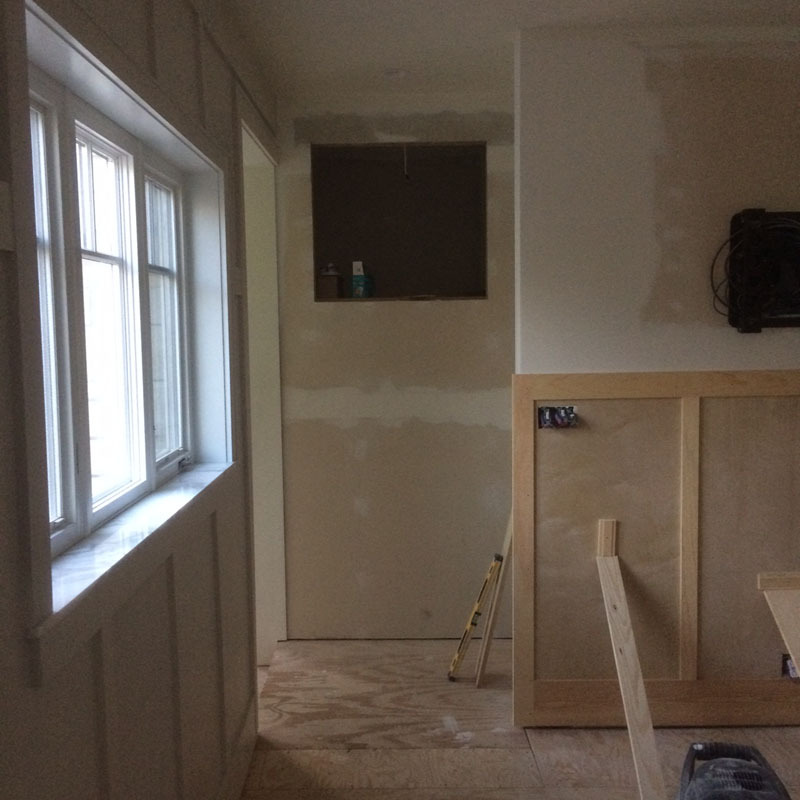 When I started the first floor bathroom renovation, I worked hours and hours to try and straighten out the common wall with the kitchen and first floor bathroom. It looked like this after I noodled and fiddled and made it workable on the inside. I built the recessed medicine cabinet with a mirror for the back – I didn’t want a stray nail or screw to come through from the other side. This is the other side of that wall. My plan was to add a half wall of panel and finish the upper section with paint. Once I got the banding temporarily in place I realized the wall was pretty wonky. Time for plan ‘B’. I decided to build the wall in one piece instead of attaching each individual piece. This will give me a straighter finished wall – I hope. I used Kreg screws and glue to attach the top and bottom bands as well as the three cross pieces. 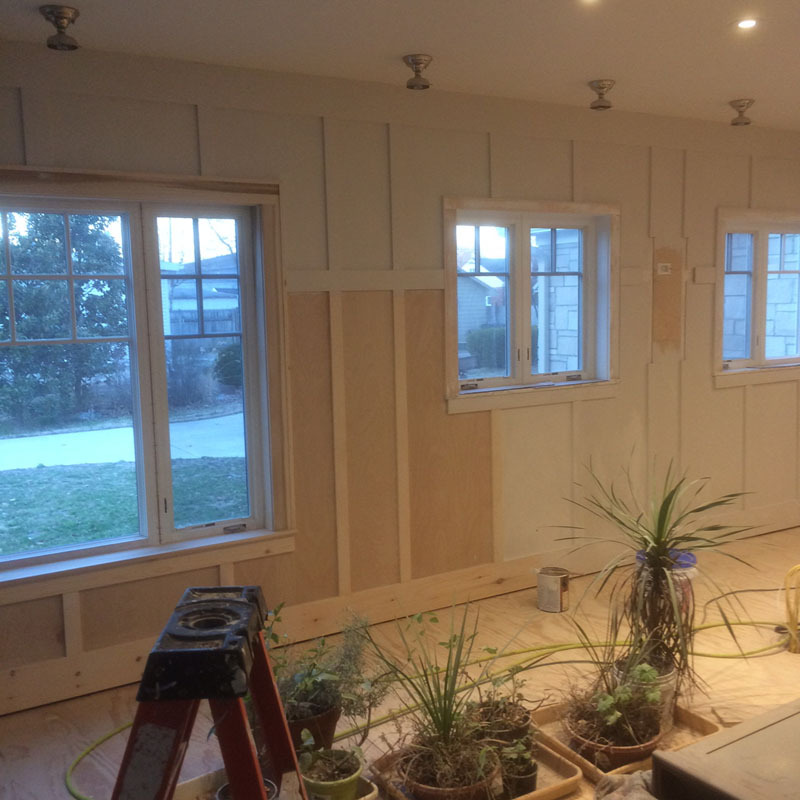 I then cut glued and nailed the plywood panels in place. The panel is 54″ tall and a little over 8′ long. 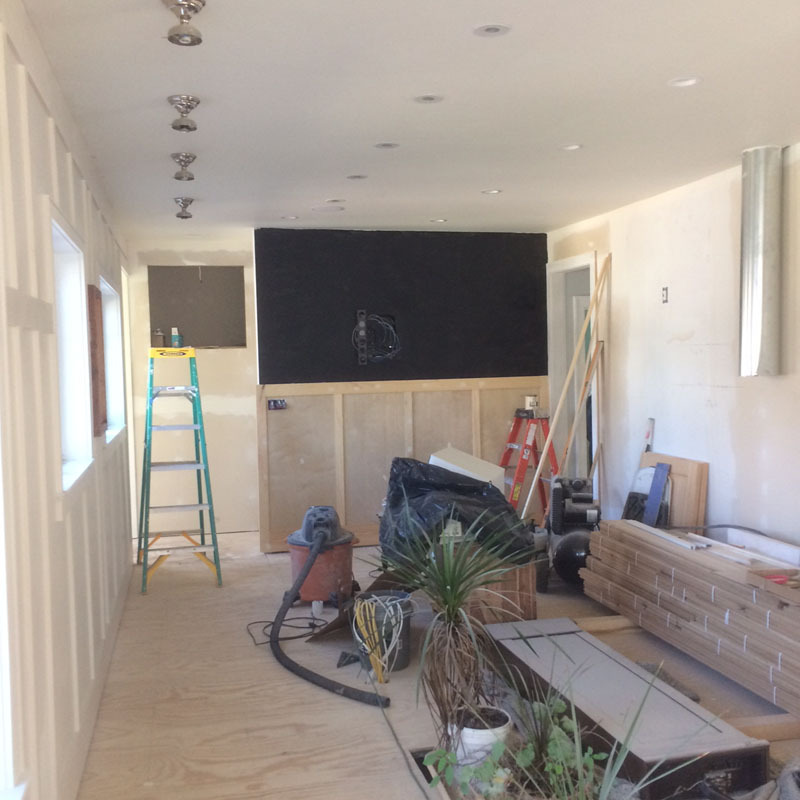 The cutouts for the light switches and framing around the air vent are in place. 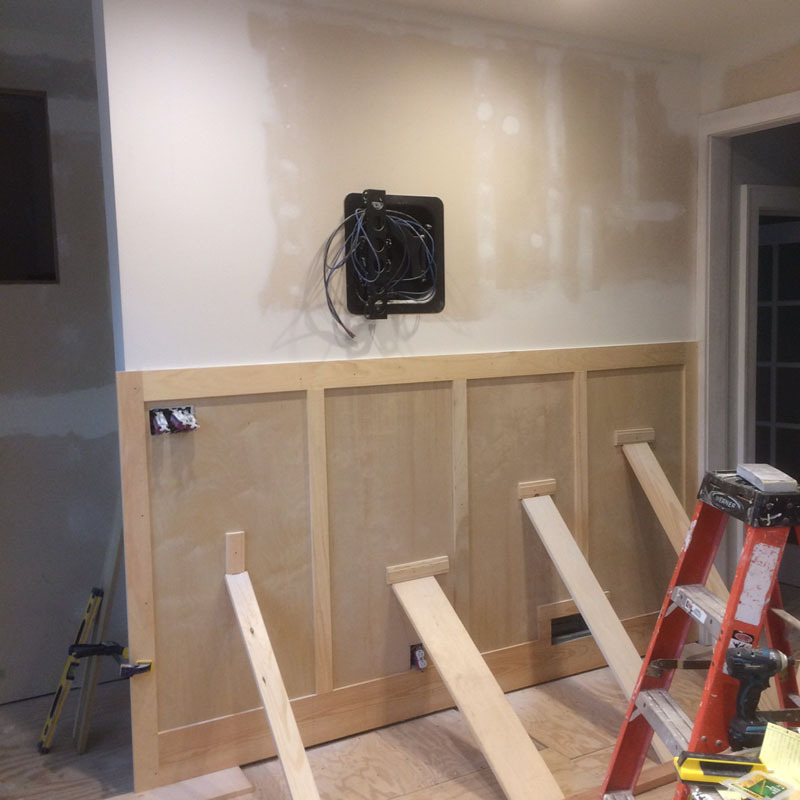 The recessed TV mount is fully articulated and wired. The cutout for the receptacle is in and the whole assembly is polyurethane glued in place. Screws were used to attach the banding and braces in place to apply pressure to the wall. 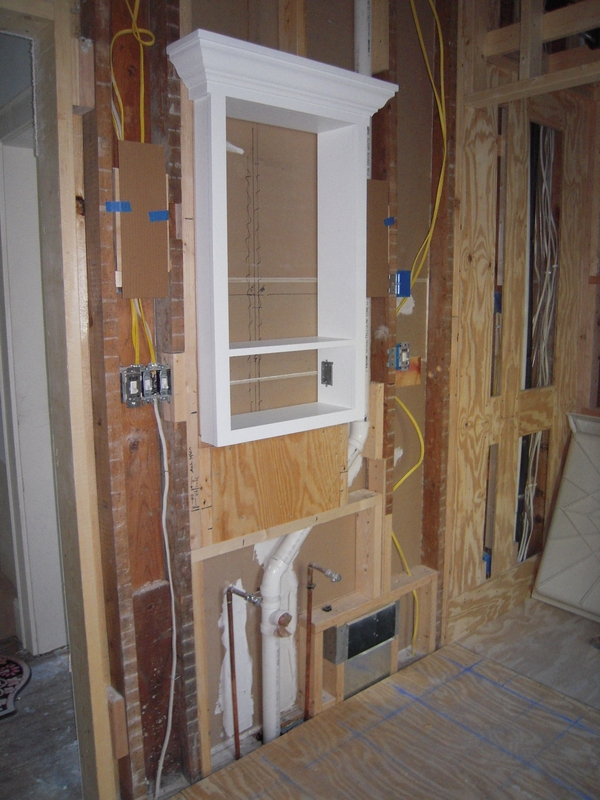 Sections of the wall were a no-go for nails or screws because of vent pipes and that recessed medicine cabinet. And now I have to figure out this storage area that is above the basement stairs. Another puzzle to figure out.This space is 34″ deep and 36″ tall and 8′ long. The top of the wall is painted a flat black enamel. This will help the TV blend in to the space – hopefully. This section is painted now so the pre-painted wood banding that goes around this area can be installed for a clean look. Hang in there – something will happen, as soon as I figure this out. 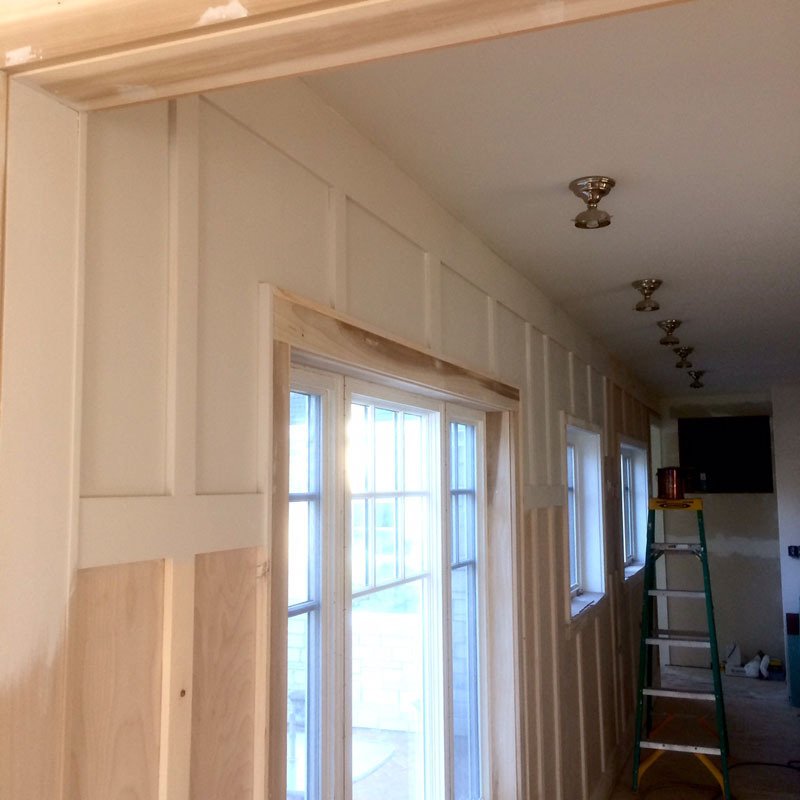 This entry was posted in 1930's bungalow, Kitchen and tagged 1930's bungalow, board & batten, home remodeling, Kitchen renovation, Old Home Renovation by curt. Bookmark the permalink. Excellent work. I really like looking at your posts. It inspires me and as soon as all our structures are up; it’s time to beautify. Thanks Mark & Krista! Well, I don’t have to fix snow blowers, so that frees up a little time. 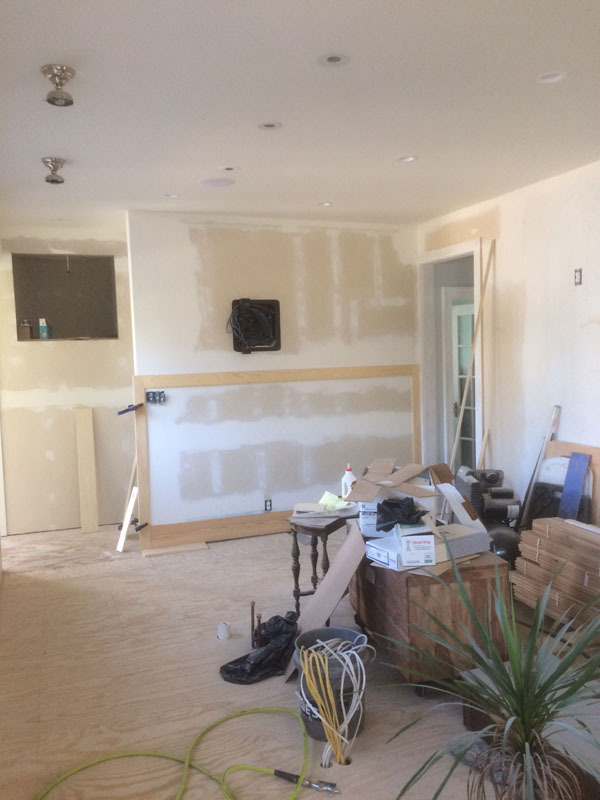 I hope to get this place done this year – we’ll see. Done this year? That would be awesome, Curt! Hi Lynda! Well, a guy can dream, can’t he? Thanks!I have a black value contrast on three walls that I hope will visually unify the space. As usual, I over-think everything, so I hope it works out.